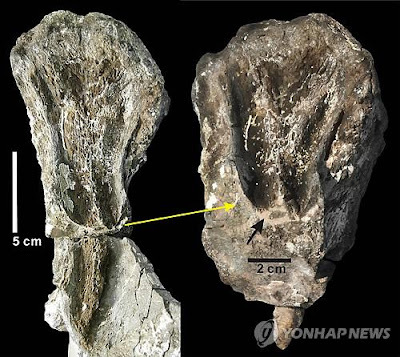 South Korean researchers said Monday that they have discovered the world's largest fossilized tooth marks of a carnivorous dinosaur in the country's southeastern province. The unusual tooth scores, found on the tailbone of the adult herbivorous dinosaur Pukyongosaurus from the early Cretaceous period of the Mesozoic Era, measured 17 centimeters long, 2 centimeters wide, and 1.5 centimeters deep, the longest and deepest scores ever discovered in the world, according to Paik In-sung, a professor at Pukyong National University, who led the research. The tailbone fossil itself was found in 2008 in Hadong, South Gyeongsang Province, some 470 kilometers southeast of Seoul, Paik added. The W-shaped marks showing the two teeth of the dinosaur form sharp grooves in the bone and were presumably etched there when the predator bit meat off the carcass, according to Paik. Apart from the largest tooth marks, many tooth scores of different sizes and shapes were also detected on the tailbone, which offers insight into the feeding behavior of meat-eating dinosaurs that lived on the earth some 120 million years ago, Paik said. "The discovery of both large and small tooth marks on a single bone of a plant-eating dinosaur serves as telltale evidence that the meat-eating dinosaurs in the past had eating habits of exploiting a single sauropod carcass, identical to that of modern carnivores," he added. The study, funded by the country's Ministry of Education, Science and Technology and the National Research Foundation of Korea, was published on the online version of the journal Palaeogeography, Palaeoclimatology, Palaeoecology last week. Palaeontologists say dinosaurs lived in South Korea from 120 million to 80 million years ago, throughout much of the Cretaceous period, the last stage of the Mesozoic era and the heyday for dinosaurs. Their fossils, relatively well-preserved and discovered in a richly diverse spectrum across the southern South Korean coasts, are currently registered on a tentative list of U.N. World Heritage sites, en route to gaining major recognition.